About halfway through playing the new Doom, I tried to remember the last time I’d died. Turns out, it hadn’t happened for hours. That was a problem. A secret difficulty, Ultra-nightmare, unlocks upon beating the game, and only allows players to beat the game with a single life. After that, it’s over. Hurt me plenty is what the game recommends to most players, saying they’ll need a “balance of focus, aggression, and fearlessness to ensure your survival.” The next difficulty level, ultra-violence, is “for players who want a challenge.” Though I’m not one to shy away from a challenge—why else am I obsessed with the Dark Souls?—I wasn’t sure what that meant in the context of Doom, so I went with what the game told me. Once I’d adjusted to the game’s rhythm, I was blowing through levels without a second thought. And though the enemies would, on occasion, manage to kill me, it was incredibly rare to find myself in real danger. On the recommendation from my former Giant Bomb colleague, Brad Shoemaker, I cranked up difficulty to ultra-violence and rolled the dice. Dang, he was right. 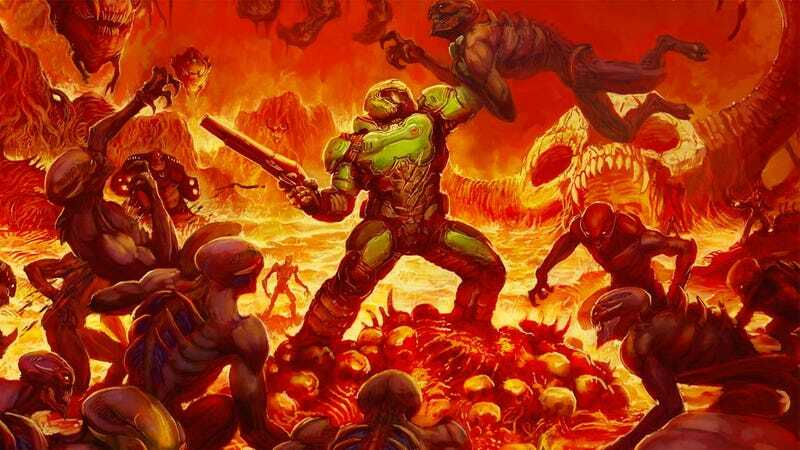 Ultra-violence is the way Doom should be played, in the same sense that Heroic is the right difficulty for Halo. It’s not appropriate for everyone, mind you, but if you’re familiar with shooters, it’s the route to go. Suddenly, minor hits have a major impact on my health, forcing me to manage glory kills, jump pads, and ammo counts in new ways. Fight against formidable foes that will truly test your skill and wits; this is the way Halo is meant to be played. Doom’s ultra-violence setting should say the same thing. If you’re still in the middle of the game, or are mulling a second playthrough, you should give it a shot. You’ll die more often, but you’ll feel way better about it.